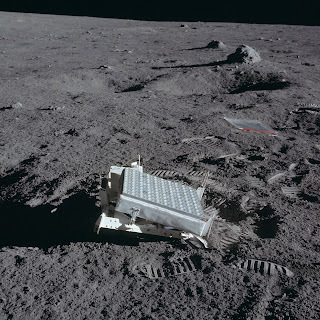 The Apollo 11 Lunar Laser Ranging Experiment. Neil Armstrong and Buzz Aldrin left behind more than just their footprints on the Sea of Tranquility when Apollo 11 returned home. They left behind an experiment that is still running today. Circled by footprints in the Moon dust is an array of 100 mirrors pointing towards Earth, known as the Lunar Laser Ranging Experiment (LLRE). The Apollo 11 astronauts left it there during their final Moon walk. Today, over forty years later, the device still works. Using these mirrors, we can bounce laser pulses off the Moon’s surface to measure the Moon’s distance very precisely. This allows us to track the moon’s orbit over time and test theories of gravity. Directed by telescope, a laser sends a pulse of photons which hit the array and bounce straight back to where they came from. 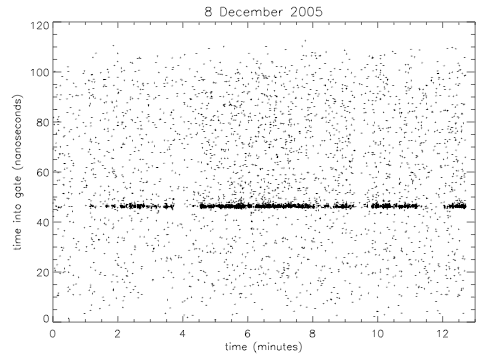 About 2.5 seconds later, a detector on Earth catches one of the returning photons. This allows us to pinpoint the Moon’s distance with incredible precision, to within a few millimeters. A graph showing photons returned from the LLRE. Credit: APOLLO Collaboration. It is extremely difficult to catch these reflected photons, which scientists have described as like hitting a moving dime with a rifle bullet from three kilometers away. Yet astronomers at the Apache Point Observatory in New Mexico have been doing just that with their laser ranging system and 3.5 m telescope. By carefully tracing the Moon’s orbit, we have learned that it is moving away from Earth at a rate of 3.8 cm per year (due to our oceanic tides). We have also verified that the universal force of gravity is very stable. Newton’s gravitational constant has changed less than one part in 100 billion since the experiment began. Physicists use the laser results to check general relativity, Einstein’s theory of gravity. Einstein’s equations predict the shape of the Moon’s orbit perfectly. The LLRE requires no power source and it hasn’t been covered with dust or destroyed by meteoroids, as feared by Apollo 11 planners. So lunar ranging should continue for decades or even centuries, further increasing our understanding of gravity.